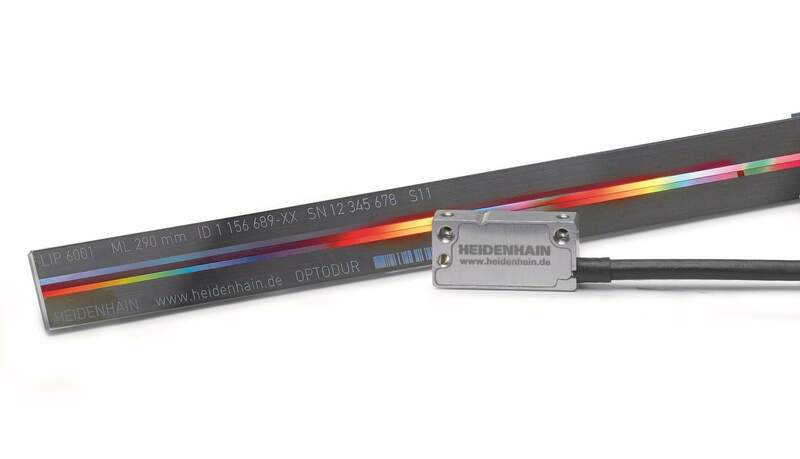 Schaumburg, IL (June 2017) – HEIDENHAIN’s new LIP 6000 miniature linear encoder system, consisting of a scanning unit and glass scale, has the unusual capability to measure to 2 nm resolution with high speed of 4m/sec at long lengths of scale. This encoder was developed with large mounting tolerances, small interpolation error and low noise levels, thereby making the encoder useful in machine feedback applications where very constant speed control is needed or high position stability at standstill is important. Industries that could take advantage of this encoder are semiconductor manufacturing, metrology, and micromachining. The LIP 6000 scanning unit contains the HSP (HEIDENHAIN Signal Processor) 1.0 ASIC which overcomes contamination on the glass without the loss of accuracy by amplifying the LED light source instead of amplifying the electrical signals which leads to noisy outputs. HSP 1.0 gives the ability to have a position stability of +/- 1 nanometer RMS and a very small interpolation error of just +/- 3 nanometers. The encoders system also comes with a homing track and user-mounted optical limits for end of travel markers. At just 5 grams of weight without the cable, and dimensions of 26mm x 12.7mm x 6.8mm, the LIP 6000 works well in small spaces. Its scanning head comes with 1 Volt peak to peak or TTL interfaces, with other serial interfaces planned for later in the year. The glass scale is adhered to the machine via clamps or an adhesive and comes in normal float glass or ZERODUR. The scales will come with +/- 3 micron and +/- 1 micron accuracies, with lengths up to 3040mm. The baseline error for these scales is +/- 0.175 microns/5mm. HEIDENHAIN CORPORATION is the North American subsidiary of DR. JOHANNES HEIDENHAIN GmbH, a leading international manufacturer of precision measurement and control equipment. The product line includes linear scales, rotary and angular encoders, digital readouts, length gauges, CNC controls, and machine inspection equipment.